Description: This video was shot with a DJI Inspire 2 & X7 Camera with 50mm lens. Visit DJI for more info by clicking below. 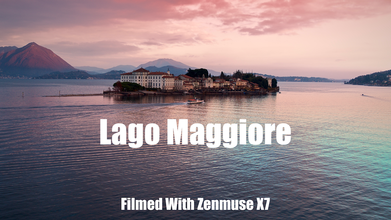 http://click.dji.com/AEfSUZSvrZ72BewOANw?pm=link The Islands of Lake Maggiore in Italy filmed with DJI Inspire 2 and Zenmuse X7 camera in 5k. Featuring: Isola Bella, Stresa, Isola dei Pescatori, Isola delle formiche, Isola Madre and Santa Caterina del Sasso Monastery on the Lombardia side of the lake. Lake Maggiore (Italian: Lago Maggiore means 'Greater Lake') is a large lake located on the south side of the Alps. It is the second largest lake in Italy and the largest in southern Switzerland. The lake and its shoreline are divided between the Italian regions of Piedmont and Lombardy and the Swiss canton of Ticino. Located halfway between Lake Orta and Lake Lugano, Lake Maggiore extends for about 65 kilometres (40 miles) between Locarno and Arona. The climate is mild in both summer and winter, producing Mediterranean vegetation, with many gardens growing rare and exotic plants. Well-known gardens include those of the Borromean and Brissago Islands, that of the Villa Taranto in Verbania, and the Alpinia Botanical Garden above Stresa.